We reconnected last summer and had a very enthusiastic conversation about one of my Liberty paintings when Frank told me he is also a painter. Earlier this year, I became a member of a local gallery, where he shows regularly, and saw his work first hand. Most of Frank's paintings are either whimsical or very brightly colored. I know him best, as an artist, for his folk art works at the Quinlan Center. Imagine my surprise when I showed up earlier this week to help hang a show at the gallery and saw this new piece. I immediately asked Frank to answer some questions about his sculpture and paintings for an article here. You can read the rest below. And please, forgive my shoddy photography. The photos (above) do not do justice to the sculpture. How long have you been exploring the genres of Americana and reclaimed art in your personal work? Frank Norton: Since college, I have been collecting architectural and antique components. I have collected hundreds of pieces over the years. This is my first intentional marriage of reclaimed pieces in a three-dimensional work. 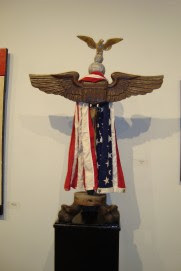 I have been incorporating patriotic images in my two-dimensional work for over ten years. Do you paint in other styles or address other themes in similar media? Frank Norton: I am an experimental artist, currently exploring color and texture in a series on social conscious works as enlightenment against Castro's Cuban communism. My mother is Cuban, hence the personal connection. I am currently playing with encaustics, but they keep falling and peeling off the substrate, so I just laugh. Frank Norton: My favorite is rich, thick oil paint, used in layers and textures. Are you new to sculpture? Frank Norton: Yes, but reception has been terrific and I have others in process and more swirling around in my brain. What is the title of the piece showing in the Members’ Show at the Quinlan? Frank Norton: House and furniture parts, lion feet from a Victorian piano, walnut leg from a sewing machine, Irish carved wings from most likely a piece of furniture or room molding and an American eagle gold leafed from a weather vane. The antique flag was salvaged from a bind of flags soon to be burned in a Boy Scout flag purification ceremony. I personally have a very strong emotional reaction to the sculpture. Was it your intent to invoke patriotism and passion for liberty when creating the piece? Frank Norton: Absolutely, it’s a powerful patriotic statement, but in the same sense it evokes the cross of Christ and the strong determination of the eagle with the compassion of a worn, draped American flag across the neck of that cross. I know you are very well thought of in the N. GA folk art communities and contribute significantly to the Quinlan Center as well as being a patron to several local artists. But, how long have you been involved in the arts as an artist? Frank Norton: I grew up with art, was in some of the Quinlan's first children’s art class, still have that crude lion I made at 8 years old. My youth was intertwined with art and Boy Scouts. My parents were collectors and my wife and I began collecting when we were first dating. I only started painting and selling in the late 1990’s and give most of my art away today or sell art with proceeds going to a nonprofit foundation set up by my wife and I to support children’s needs in North GA.
How do you balance your creative endeavors with your business persona? Do you find a therapeutic benefit from the art in contrast to the pressure of running a business? Frank Norton: Classic left brain and right brain activity. Art gives my life compassion and roundness; my business enables me to connect with community. I want to leave the community that raised me a better place for all. Would you mind giving us an artist’s statement? Frank Norton: With my latest creations I have finally found my artistic voice. Adolescent years playing with my chemistry set, fascination with the swirls of Latin-inspired colors and themes. Manipulating textures with the same fascination a Boy Scout has with fire. I channel my energy toward the spiritual nature of my Cuban artworks. A deep physical connection with the long pain and suffering makes my eyes well up and my mind whirls with what-ifs. What is your personal view of using art to advance a political narrative? Frank Norton: I'm doing just that with my Cuban series “Under the Cuban Son.” I have no problem with advancing art as a social or political statement. It’s been done for 3000 years.